City girl moves to the Country! 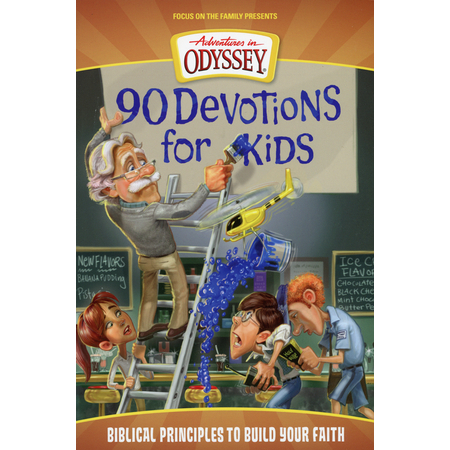 We were in the market for a new devotional, so when I saw the Adventures in Odyssey available for review I scooped it up right away! My children 10 and 12 love adventures in Odyssey and couldn't wait to read the next days devotion. As a new home school mom we are incorporating this book into our "Bible time". If you and your family have listened to Adventures in Odyssey, then you will be familiar with Mr. Whittaker, Connie, Eugene, and Wooton, characters from the series. These characters are in every devotion and share interesting facts, and life applicable stories throughout the book. Each devotional is tied to a particular episode within the main text. However, even if you or your children are not familiar with Adventures in Odyssey, enough information is given for you to understand the example and how it relates to that day's point. A Bible is required to look up verses in the Devotional. I personally loved this aspect of this devotional as it is centered on the word of God and not just the characters views or experiences. The devotional is divided into thirteen themes, including Exercising Faith, Witnessing, and Worship . We loved the format of the book and found it easy to read and engaged the children. A fun review puzzle is included at the end of each week, along with a printed prayer, Daily challenge and memory verse. I would highly recommend this fun, and informational devotion for your family! I received this book complementary from Tyndale Books, in exchange for my review. Thanks for stopping by. I'm a self proclaimed city girl transplanted into the country. Who knew homeschooling, a plethora of chickens and simple living would define my life. I love to write about the country life, autism, book reviews and crafty DIY hobbies. Journey along side me and experience, the joys, the trials and the adventure the country has to offer. I love God and the life he has blessed me with. I am excited to live that life to the fullest. almost 1 year in the country. Chocloate cupcakes gluten free, oh ya baby! Ducklings Hatch, then go missing! Homeschool resources: Canadian Government study! How chore pouches changed my life! Autism: President's Choice Children's Charity: (Superstore) Helping Local Families. A WONDERFUL JOURNEY THROUGH AUTISM Written by a 11 year old Autistic girl.